These twin cylinder middle weights may fall in different price bracket, but are more or less evenly matched in the power department. Ducati recently introduced the youngest member of the Monster range - the Monster 797, in India. Equipped with an L-twin motor, it is hard to find any direct rival to this Italian motorcycle. The recently launched Triumph Street Triple S is priced slightly on higher side, but pumps out a substantial 111bhp from its 3-cylinder motor, thus making the baby Monster’s 75bhp look effectively puny. Therefore, we pick the two motorcycles which lock horns with the Monster 797 in the field of power - Kawasaki Z650 and Harley-Davidson Street Rod. Read on for the autoX specification comparison. The Harley Davidson Street Rod looks like the odd one out here, and it really is. It might have ‘street’ in its name but the overall design aesthetics of this American are more cruiser like. Staying true to that philosophy, it's the longest and the heaviest in this group. The Kawasaki Z650 and the Ducati Monster 797 both belong to the street fighter group and reflect their respective manufacturer’s design philosophies. The Monster 797 looks so much like the bigger Monsters that an untrained eye may struggle to distinguish between the three. The Kawasaki, on the other hand, isn’t as beefy as the Ducati. 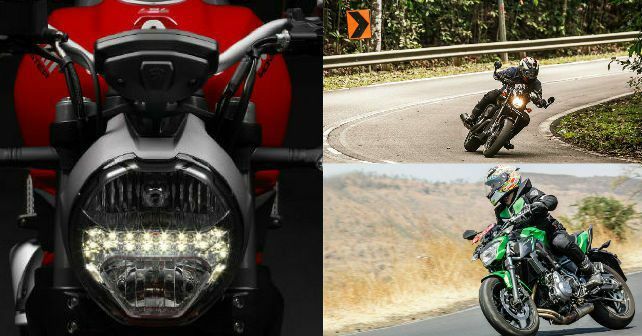 Its headlamp design isn’t as aggressive as the other Kawasaki Z series bikes either. But as a whole, it's a proportionate, inoffensive design. All three motorcycles mentioned here have twin-cylinder powertrain set-ups. Monster 797 shares its L-twin motor with the Ducati Scrambler. This engine, despite being less powerful than the older Monster 796, pumps out the most muscle in this group at 75 horses. The Street Rod produces 70bhp but has a massive weight disadvantage in this group. Also, despite its big 749cc motor, torque figures, at 62 Nm, are the least in this group. Even with a 649cc engine, the Kawasaki Z650 produces more torque than the Harley. The parallel twin engine on the Z650 is largely the same as it predecessor - ER-6n. The Monster 797 houses twin 320mm semi-floating discs with radially mounted Brembo Monobloc 4-piston calliper at the front and a 245mm disc with a single-piston calliper at the rear. Dual channel ABS developed by Bosch comes standard. The Kawasaki too comes equipped with a Bosch developed ABS. For braking, upfront there are semi-floating 300mm petal discs with dual piston calipers, and rear houses a single piston calliper with 220 mm petal disc. For the Harley, 300mm 2-piston floated disc are present both up front. Being a CBU, the Ducati Monster 797 is at a sheer disadvantage when it comes to price. It may be the most powerful bike here, but at Rs. 7.77 lakh (ex-showroom, Delhi), it itches dangerously close to the Triumph Street Triple S, which retails at Rs. 8.5 lakh (ex-showroom, Delhi). The Kawasaki 650 is the value-for-money champion here. Retailing at Rs. 5.19 lakh, it is over a staggering Rs. 2.5 lakh cheaper than the Ducati, which makes it a lot of bike for the money. The Street Rod too, at Rs. 5.96 lakh, appears to be priced incredibly well in comparison to the Ducati.